I’ve recently gotten into the television show Doctor Who and as a result, so have my husband and kids. It’s become commonplace in my house for us to gather around the television to watch an episode, new or old, and spend time together. We’ve fallen in love with the characters, both good and bad. We own toys and collectibles. We talk about their adventures. We just can’t get enough. We are Whovians and we proudly admit it. So when I decided that we all, as a family, were going to attend a local comic convention I knew I’d end up creating a Doctor Who themed costume. So, when I asked the kids what they wanted to dress up as (because dressing up is half the fun of a con) my daughter immediately said Dalek and began threatening me with extermination. After discussing the different ways we could go about creating our very own Dalek, my husband and I settled on a cardboard masterpiece. He created the main “body” parts (since he’s the engineer in the family) while I worked on the details and headpiece. We used several medium sized corrugated, cardboard moving boxes. (I knew there was a reason I kept those.) Using a reference picture and a handmade template, my husband measured and cut each of the boxes into the individual planks used to create the body shape. Starting with the front pieces, several sticks of hot glue were used to attach the planks to each other. Additional cardboard pieces were measured, cut, and glued to create the bottom bumper, details, and the inside support structure. Once complete, the whole thing was coated with two cans of metallic gold spray paint. For the weapons, a standard cheap plunger (from the store not the bathroom) and a paint roller were sawed down, sanded, and coated in metallic silver and glossy black spray paint. The headpiece was constructed from papier-mâché using an 8” round bowl. Several layers of white copy paper were applied before being sealed and spray painted in gold and black. Foam pieces and elastic were hot glued to the inside of the hat to make it more comfortable and keep it from falling off. To create the two lights on top of the head, two 4 oz clear plastic cups were spray painted opaque white while 2 flickering candle LED lights were attached inside. And a cheap, blue plastic flashlight was disassembled, and again hot glued, to create the eyepiece in the front. To improve movability and wearability, 5 caster wheels were attached (can you say hot glue) to the bumper and 2 elastic shoulder straps were weaved into the top pieces. Overall, it was a really difficult costume. We spent a lot of time coming up with the original design and cutting all of the cardboard pieces. Spray painting took a while as there was so much to paint and we had such horrible weather. In all, we used about 6 cans of paint and 4 packages of mini hot glue sticks. We cut and burned ourselves countless times in the process. And to make it all worse, we couldn’t even fit it in the truck of the car (like my husband assured me we would). 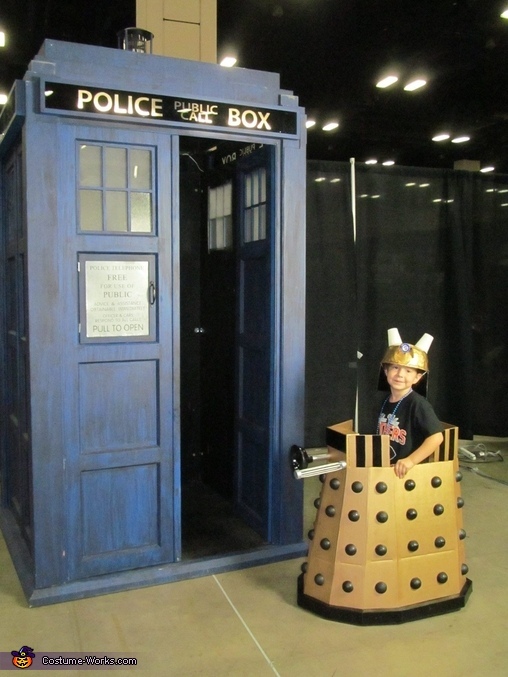 I ended up sitting in the back of our small car with my two kids, while the Dalek sat in the passenger seat. It blocked the rearview mirrow and AC vents, hung out the window, and completed obscured the middle console. It was a bit of a traffic nightmare. In the end, we all (including the Dalek) made it to the con in one piece. My daughter had a great time in costume (though she was constantly stopped by strangers asking to take a picture). We had lots of good comments on it and are quite proud of it. She will probably never wear it again but after all the work we put into it, we just couldn’t toss it. It now has a permanent home amongst the rest of our Doctor Who collectables.